About Us | DIANA mit Menthol, das tut wohl - seit 1897! WELL-BEING SINCE 1897 – DIANA MIT MENTHOL! At the beginning of the 20th century, a Hungarian pharmacist discovered not only the incredible effect but also the tremendous sales potential of menthol-added rubbing alcohol. Soon, his pharmacy “Diana” was so well-known for the home remedy that in 1907 he registered his tonic under the same name as a trademark. The well-known logo, which enjoys cult status, shows the Roman goddess of the hunt “Diana” and symbolizes love of nature and vitality. These are not only properties with which athletes and sports enthusiasts can identify with but also demonstrate the range of application of the products! To date, the original recipe is virtually unchanged and consumers’ confidence in DIANA products is greater than ever before and the product is an indispensable part of a well-stocked medicine cabinet! 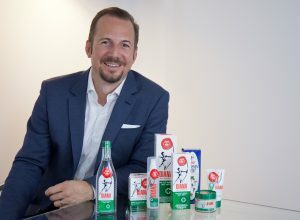 In the course of the century, the owners changed until finally in 2014 the family-run company of Unipack GmbH took over the traditional brand. Since then, Diana is again firmly in Austrian hands and continues to conquer consumers of this century with quality, naturalness and effectiveness! The old goddess and the young entrepreneurial spirit! If I think back to my childhood, then I can still remember well the visits to my grandmother. Especially to her bathroom. The small flowers on the tiles, the handmade soaps from the wild flowers and herbs of the surrounding fields and meadows and the small box with the creaking door, behind which she hid her medicine cabinet! No matter if the grandpa had a headache (of course because of the weather and not because of the visiting the pub the day before!) or a tense back (of course because of the heavy work and not because of the heavy grandma, whom he always carried on his hands, but preferred to hug instead), even with aching legs after long walks, the sore muscles after playing football or when we kids could not fall asleep because of the summer heat, the grandma knew what was the trick for immediate relief: DIANA! No chemicals, only natural ingredients! A rubbing alcohol made according to the old recipe and mixed with menthol which you can use for rubbing, massaging, gurgling or even as a compressor and feel how it immediately enhances well-being and has done so for more than 120 years! But where does DIANA come from? And what is actually hidden in this ever popular “miracle cure”? David, DIANA is a brand with a long tradition, where are the origins of the company? DIANA has existed for almost 120 years, since 1897, and is one of the first registered trademarks in Austria. The story of the genesis of DIANA is very interesting! France was already known for its wine spirits and specially produced spirits were used as remedy. The name rubbing alcohol goes back to this French origin. Adding menthol, which came from the Far East, made DIANA the unique product with menthol it is today. Even today, it is produced according to the unchanged recipe from 1897. DIANA is thus a unique natural home remedy that characterizes Austrian history. Now the question comes to mind is whether you can also drink the DIANA rubbing alcohol? No, the rubbing alcohol serves purely for external application! In this context, I can refer to the DIANA Melissa Spirit, which is intended for oral intake and is distinguished by its unique orange flavour. The recipe of healing plants and herbs unfolds its effectiveness in case of physical exhaustion, stress and stomach discomfort. The Austrian family-run company of Unipack GmbH purchased DIANA in 2014. Thus, the brand is again fully in Austrian hands. As product manager of DIANA you take care of the fortunes of the traditional brand. Why is a young entrepreneur looking for a product that is mostly a term for an older target group? As an Austrian family-run business we are proud to work with the traditional product DIANA with menthol. It is true that the DIANA with menthol is a well known brand from the past but in no way outdated! If we track the trend in recent years, we see that there is a return back to nature. We live in a growing organic society and you can see that younger persons are increasingly using the well-tried natural home remedies. The logo, the Roman goddess of the hunt, is still the same as in 1897 and has already gained a cult status, did you consider a new design during the acquisition? I am sure you share my opinion that thanks to our hunt goddess Diana, which embodies nature and vitality, our glass bottles are very trendy. Retro and vintage are currently omnipresent and on everyone’s lips. But I would also like to point out that our range of products has both a sports balm in the jar and in the tube, as well as a pump spray to offer as an alternative. Not only is it one of the first registered brands in Austria, DIANA is also one of the oldest legally protected packagings in Austria. What is the difference between the DIANA Sport Balm and the original DIANA rubbing alcohol? The rubbing alcohol is still produced today according to the original recipe from1897 and promotes blood circulation. Natural menthol cools the skin and provides immediately noticeable relief. The balm has the additional nourishing properties of a cream, cools and works with greater effect. It does not grease and absorbs quickly. Who counts among the customers of DIANA? For whom are the products particularly suitable? This is easy to answer, DIANA just enlivens everyone (laughs) and this is confirmed by the slogan: Diana with menthol, it’s good for you! It is suitable in everyday life for heavy, tired legs, for tension, but also in sports. It promotes blood circulation and regeneration to prevent muscle soreness. DIANA is a real panacea and must not be missed in any medicine cabinets, not even in yours, right? Yes, that’s right, it’s an absolute must in every medicine cabinet. I use DIANA before and after the sport, but also simply for refreshment in between. Everyone knows the feeling in the summer, when the body simply does not want to cool down, this is the best time to use DIANA! Which is the DIANA product you always have with you and why? I always have the DIANA pump spray with me, because for me it is the easiest way to use it and fits in any sports bag! Where will the path for Diana lead in the future? What are the goals you have set yourself and for the brand? The first step in the journey was to bring DIANA back to Austria. What I can reveal is that we stay innovative and that you will still hear a lot from DIANA!